Kalmar had an excellent concept and proposal and their team was outstanding from beginning to end. They met our specification in every way and the two Super Glorias will have a huge impact on our business, Samuel Iglesias, DIRECTOR TADARSA LOGISTICS S.L. Two Kalmar Gloria DRG1300-92ZX reachstackers, the largest reachstackers ever built, help Tadarsa Logistics S.L. move gigantic wind turbine sections in Avilés, Spain. Tadarsa Logistics S.L. provides an all-round logistics service with a global reach. It is part of the Daniel Alonso Group, which has more than 50 years of experience in the design and manufacturing of steel tubular structures, pressure vessels and large metal structures, steel treatment and the logistic management and storage of end products, among many other activities. Tadarsa operates on a 20,000 m² manufacturing area less than 1km away from the port of Avilés in northern Spain. Tadarsa contacted Kalmar with the need for equipment capable of lifting heavy wind turbine sections, which can weigh up to 260 tonnes. “We chose to work with Kalmar because they are such a well-respected global company and we couldn’t trust anyone else to take on such a mammoth task,” says Samuel Iglesias, Director, TADARSA LOGISTICS S.L. 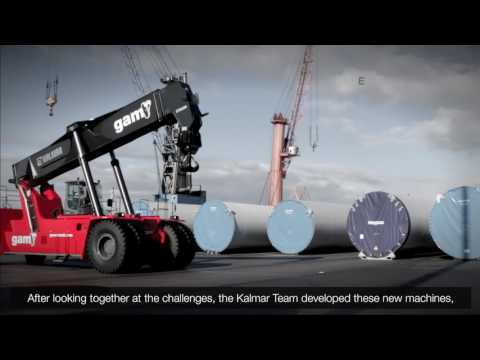 the biggest machine ever built,” says Stefan Johansson, Director, Sales and Marketing, Kalmar Reachstackers and Empty Container Handlers. Tadarsa is delighted with the end result. “Kalmar had an excellent concept and proposal and their team was outstanding from beginning to end. They met our specification in every way and the two Super Glorias will have a huge impact on our business,” Samuel Iglesias enthuses.